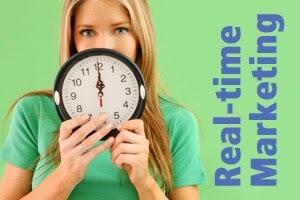 5 keys to making your real-time marketing work for your company. Since Oreo’s outrageously successful “You can still dunk in the dark” tweet during the Super Bowl XLVII power outage, several brands have attempted to adopt the quick-and-witty tactic of real-time marketing. Unfortunately, there are many more examples of RTM failures than successes. Take U.S. Cellular, for example. Following Adele’s big win for the “Skyfall” theme song in 2013, the company tweeted “What if her lyrics come true?” with a picture that said “The sky may fall, but we won’t drop your call. Punny? Yes. Funny? No. 2. If you are going to do it, plan in advance. While RTM might seem like a spur-of-the-moment thing, the successful endeavors are ones that are well thought-out. Before the event begins, think about what you could post based on various outcomes. What if Team A loses? What if Movie C takes home the Oscar? 3. Make it relevant. The best RTM tweets are those that relate directly to the timely event. For example, NASA used the movie Gravity’s big wins at the Oscars to share photos of Earth from space. Think outside the box to find connections to your own brand. 4. Think small. There might not be a great way to promote your business by relating it to a national awards show and that’s okay. Some of the best RTM is based around local events. By focusing on a smaller audience, you’ll be better able to target potential and existing customers. 5. Integrate it into your everyday marketing. Why was Oreo able to remain quiet during this year’s Super Bowl? Because each day they generate timely content for their followers. RTM is the most effective when it is part of a conversation with your audience. Use it to show off your outstanding customer service and great sense of humor. If you notice a follower is turning 50, tweet a special image wishing them a happy birthday. If one of your best customers tweets about their desperate need for coffee, send them a Starbucks eGift. These small acts of kindness show you actually listen to what your followers have to say. True, RTM is a great way of promoting you product or service but you need to plan it in advance to avoid failures. And it's good to know that RTM is effective in interacting with the audience. These tips you provided are benefecial for those who do real time marketing. Thank you! If your interested, check the PPC Training by ClickMinded.